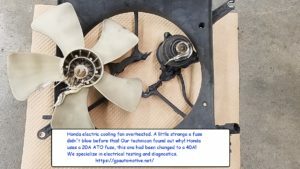 Overheated electrical cooling fan motor! Posted by benz on January 25, 2019 . No comments. “Melted or what?” This is a good example of a electrical circuit overheated because of the wrong fuse installed. Our technician found the fuse was wrong. This was not a good repair. This could have been a fire! Electrical fires in automobiles are the most dangerous because many fuel sources. The cars cooling system was overheating and some strange burning smell.